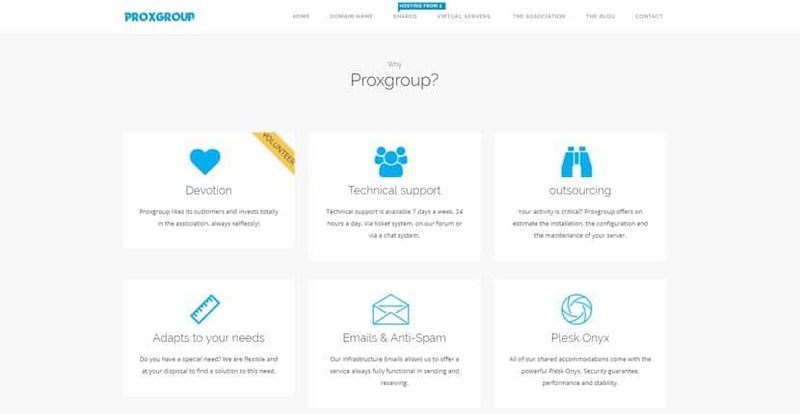 Association Proxgroup Review 2019: Is Association Proxgroup a Good Hosting? Association Proxgroup is a small volunteer-run business that provides personalized, user-friendly shared and VPS hosting services as well as free hosting to qualifying organizations. Their vision is to make high-performance hosting available and accessible to customers around the world. In 2015, a team of volunteers founded Association Proxgroup as a hosting provider with a focus on personalized customer experiences and user-friendliness. Their volunteer spirit continues to this day as all of the business’s profits go back into maintaining their operations without any compensation for the management team. They currently host over 3,000 websites for over 1,900 satisfied customers. Handily, they offer WordPress shared hosting with the CMS pre-installed, as well as a choice between either Windows or Linux hosting for their VPS with the same option coming soon for shared hosting. Still, you do get the idea that their platform is a bit minimal with almost nothing included for free or any proprietary software (e.g., Cloudflare, LiteSpeed, and so on). You’ll need to rely solely on Plesk and your own hosting administration abilities to install all of the tools you need or want. Fortunately, the signup process is very straightforward with few upsells. Start: 5 GB storage, ten email accounts, one domain, and two FTP accounts. Medium: 25 GB storage, 25 email accounts, five domains, ten FTP accounts, and a free domain. Full: 75 GB storage, 50 email accounts, 20 domains, unlimited FTP accounts, and a free domain. WordPress Hosting: 10 GB storage, unmetered traffic, five email accounts, unlimited subdomains, unlimited FTP accounts, one database, and one free .fr or .com domain. VPS: VPS servers provisioned in ten minutes or less. Resources can be scaled up at any time. VPS Linux: One to 12 vCores, 1 to 16 GB RAM, 20 to 130 GB SSD storage, 50 to 200 Mbps connections. VPS Windows: Two to 8 vCores, 2 to 8 GB RAM, 30 to 60 GB SSD storage, and a 200 Mbps connections. Interestingly, they also provide free hosting plans for non-profits, charities, and other community-focused websites. You can contact them to apply and their board will determine whether you qualify. The free hosting package includes 5 GB storage, ten email accounts, two databases, and a free SSL certificate. Although their prices are very low, their plans are slightly restrictive when it comes to the resources and features. The WordPress hosting seems particularly expensive, especially when compared to their regular shared hosting. Their VPS hosting plans are the most affordable in comparison to the competition. Unfortunately, Association Proxgroup only offers ticket support for technical issues. However, their technically-sound support staff still provides fantastic one-on-one support. There is also a knowledge base with self-help resources, but it’s not complete yet. What’s great about Association Proxgroup is their vision to make hosting accessible to all. They have very affordable shared and VPS hosting, but they lack a fuller set of features and resources. Wondering how Association Proxgroup stacks up against other Web Hosting companies? Enter any other Web Hosting company and we will give you a side-by-side comparison.